Himachal Pradesh the land of snow caped mountains, passes, lakes both natural and manmade and the verdant valleys attracts every tourist the place is purely tourist delight. There are immense opportunities and many ways to explore Himachal, it depends upon individual how you want to explore it and for everyone there is pleasant surprises that welcomes you the place is full of natural abundance and holds the perfect combination of excitement and fun. Arrive at Chandigarh railway station/airport and transfer to Shimla. Upon arrival hotel check in. Overnight stay at hotel. After Breakfast Excursion to Kufri. Kufri is famous for its Himalayan National Park, Poney and Yak Ride and One can see the endless Himalayan Panorama from Kufri, after lunch sightseeing of various places in and around. Shimla mosques built in (1830), Vice regal Lodge built in (1885), Christ Church built in (1844), The Gaiety Theatre- the first beauty contest of world was supposed to start (1887), The Grindlays Bank (1912)- the world wide bank started by Robert Melville Grindlay, The Scandal Point and The famous Shopping Plaza of the North The Mall. Overnight stay at hotel. After breakfast check out from the hotel and drive to Manali en route scenic drive en route water falls, view points and dames. Overnight stat at Hotel. 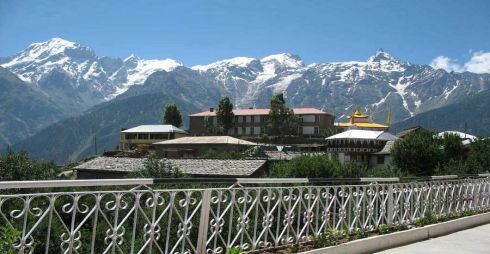 After breakfast proceed for local sightseeing of Manali visit to places like Hadimba Devi temple, Manu temple, Vashisht Hot Water Spring Bath, Van Vihar, Tibetan Monastery and evening free for shopping at the local market. Overnight stay at Hotel. After breakfast leave for Dharamshala on the way stopping at Baijnath known for its Shiva Temple and further at Palampur famous For Tea Garden. Dharamhsala is a hill-station lying on the spur of the Dhauladhar Mountains about 18 kms north-east of Kangra, It is known for its scenic beauty set amidst high pine and oak trees. Since 1960, when it became the temporary headquarters of His Holiness The Dalai Lama, Dharamshala has risen to international repute as “The Little Lhasa in India”. Upon arrival hotel check in and overnight stay at Hotel. After Breakfast drive from Dharamshala towards Dalhousie after doing the local sightseeing of Places which includes, His holiness Dalai lama residence at Mc Leodgunj, War memorial, Bhagsunath temple and Dal Lake. breakfast Dalhousie has been named after the British Governor - General of the l9th century, Lord Dalhousie. Surrounded by varied vegetation - pines, dodders, oaks and flowering rhododendron. Local sightseeing of Dalhousie includes visit to Panjipula, Subhash Baoli. Reach Dalhousie in the evening check in and overnight stay at hotel. After breakfast take the excursion tour to Khajjiar 24 km from Dalhousie surrounded by thick Deodar forest. Drive from Dalhousie to Khajjiar is awesome. Overnight at Dalhousie. After breakfast drive from Dalhousie to Amritsar. Upon arrival straight away visit to witness the Retreat Ceremony at Waga Border and sightseeing of Golden temple. Hotel Check in and visit to Golden Temple. Overnight stay at Hotel. After breakfast checkout from hotel and transfer to Railway station/airport. Prices valid from 1st April 2018 to 15th July 2018. Check In / Check out time at all the properties would at 1200 hrs (Noon). All the above mentioned rates are per person rates on twin sharing. Any amendment and cancellation in the booking before 15 days RS.500 Per Person are chargeable as communication charges . Observe local traditions and customs especially while visiting religious places. Contact your nearest Tourist office or your hotel for guidance. Always enter a temple, mosque, tomb, dargah or gurudwara without shoes on and properly dressed. One should cover his/her head with a cloth while in a Gurudwara or Dargah. Keep identity card/passport with yourself while travelling. Himachal has an wide range of weather conditions. Most areas of Bilaspur, Una, Solan, Sirmour, Hamirpur and Kangra are largely warm to hot in summer, and mild to pleasant in winter. The district of Chamba, Kinnaur, Kullu, Shimla and Lahaul and Spiti are mild to pleasant in summer and cold in winter. Do check the type of clothing and other equipment you may require for the region you are visiting. Take care of proper disposal of your bio degradable/ non degradable waste while you are exploring Himalayas or anywhere else. Dispose all litter carefully. The use of plastic bags is banned in Himachal. Stop at Government emporiums. Prices are reasonable and quality assured. Don't stand at the edge of cliff or on the bolder near the bank of river for photographs etc. The current of the river in Himachal Pradesh is very strong. Don't leave non - biodegradable litter behind. Polythene is banned in Himachal under Non-Biodegradable Garbage (Control) Act of 1995. Smoking is not allowed in public places under Prohibition of Smoking in Public Places Rules, 2008. Don't eat anything offered by fellow travellers on train or road travels. It might have sleeping pills. Don't buy articles made from rare or endangered species or animals. Antiques more than 100 years old may not be purchased. Do not leave your cash and valuables in your hotel rooms. Keep your cash dividend in different pockets. Do not carry any prohibited substance covered under Narcotic Drugs and Psychotropic Substances Act, 1985. Females may not be photographed without their consent.